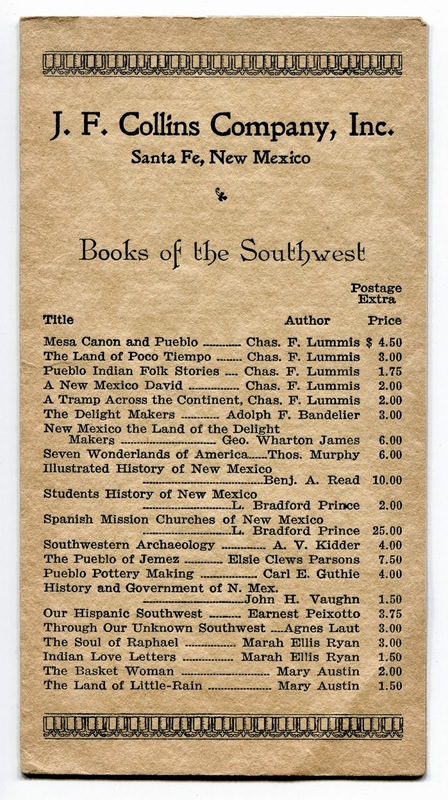 Books of the Southwest is the title of a 1920s-era catalog from bookseller J.F. Collins of Santa Fe, New Mexico. Given its brevity and size, it's not so much a catalog as it is an advertising brochure for some of the store's stock in the genre of Southwestern literature. Authors Charles F. Lummis, Mary Austin, Will James, and Charles A. Siringo jump out at me, as I've had their books in stock at various times. This 6 X 6.5-inch folded paper is printed on half of one side (the "front") and entirely on the other side (the inside pages). 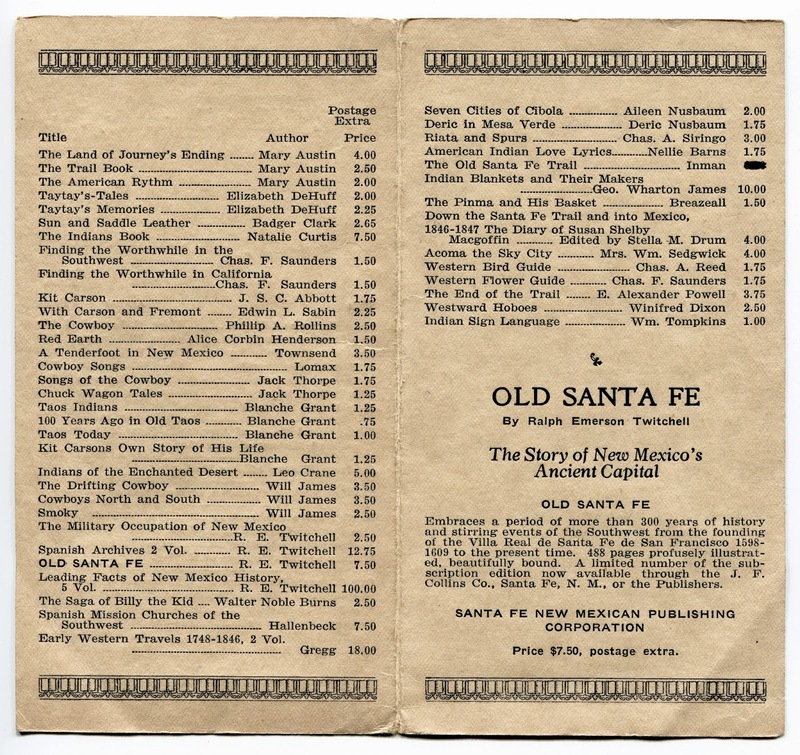 More than 60 titles are listed and one book is featured with a description: Old Santa Fe, by Ralph Emerson Twitchell. Twitchell also has the highest-priced book listed in Collins' catalog--Leading Facts of New Mexico, 5 Volumes, for $100, a good amount of money for the times. If you wanted to buy the set today, Xochi's Bookstore & Gallery in Truth or Consequences, New Mexico appears to have the only copy advertised online, and at the appreciable sum of $850. 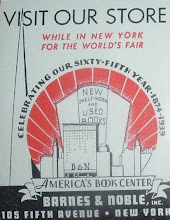 Most books in the Collins catalog are priced around a few dollars, but a few had hefty price tags for the 1920s. In addition to Twitchell's set, there was also Spanish Mission Churches of New Mexico, by L. Bradford Prince for $25. You can still find a few copies today in the relatively reasonable price range of $50 to $100. 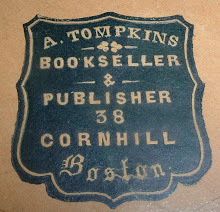 Researching Collins and his book shop did not yield much information about the bookseller and his longevity in the business. I did find the labels below at Seven Roads Gallery, always a good source of images advertising booksellers from around the US and beyond. The most revealing bit of information about the business I could find, other than the catalog itself, is a Christmas-time newspaper ad from the Santa Fe New Mexican, December 13, 1926. It provides more information about the business and inventory beyond books they carried. 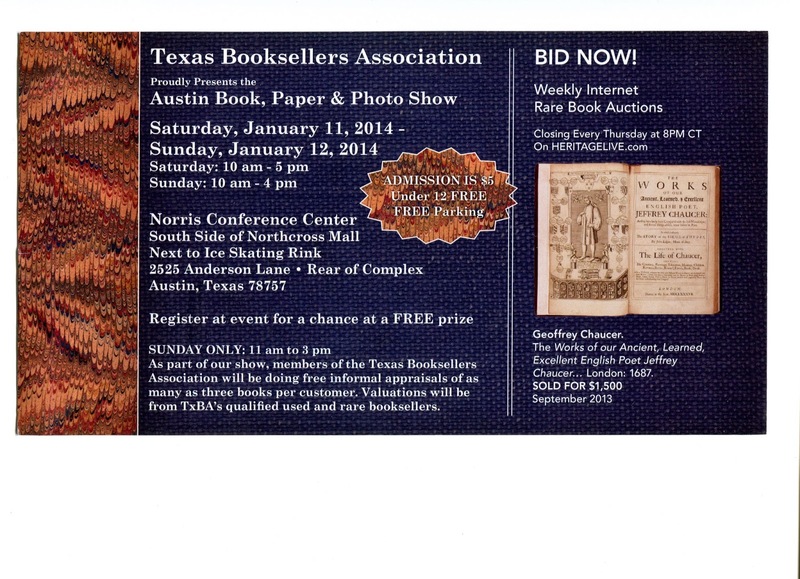 On a somewhat related note, the Austin Book, Paper & Photo Show, presented by the Texas Booksellers Association, is this coming weekend (January 11-12, 2014). 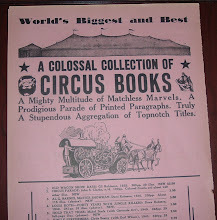 Texana and Western Americana books and materials are prominent at this show each year. 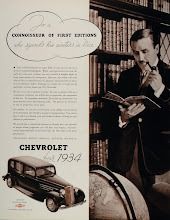 Some of the titles in Collins' stock nearly a hundred years ago will no doubt be available this weekend from various dealers in Austin, albeit at much higher prices than Collins could have dreamed of getting for them!